First I have to back this up and tell you how this started. This is some of what I posted on my facebook page on June 22.
something then have to restart my computer then try something else and restart and on and on it went. It was frustrating to say the least. While this was happening I needed something to fiddle with sitting here at my desk, a distraction! After playing with different ideas and while the computer would do it's thing, so slowly, I came up with this tiny bear. It's a bit different, the ears are crocheted right onto the bear and the limbs are chains not rounds so it works up fairly quickly. 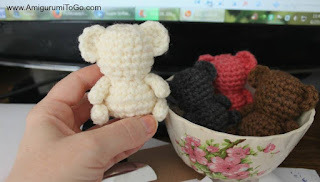 These little bears did a wonderful job of keeping my mind away from the horror of the computer. I would make one and put it in a pretty little bowl. It made me smile when I'd look over at this pretty bowl full of bears! My computer was not working, my desk was a mess but there in the middle of it all was a pretty bowl of bears, lol Sounds dramatic, I know, but it's the little things that get us through! They kept me from feeling frustrated. There was even times the computer would be ready for me to try again and I was too busy with a bear to bother and I made the computer wait for me!! Many people thought that the bears looked more koala. I didn't see it at first but after playing with ear placements I had to agree so a koala was a must. Raising the ears up just a little was more bear like and raised up on top, a frog, of course! They are cute and I just had to try out BIG ears. 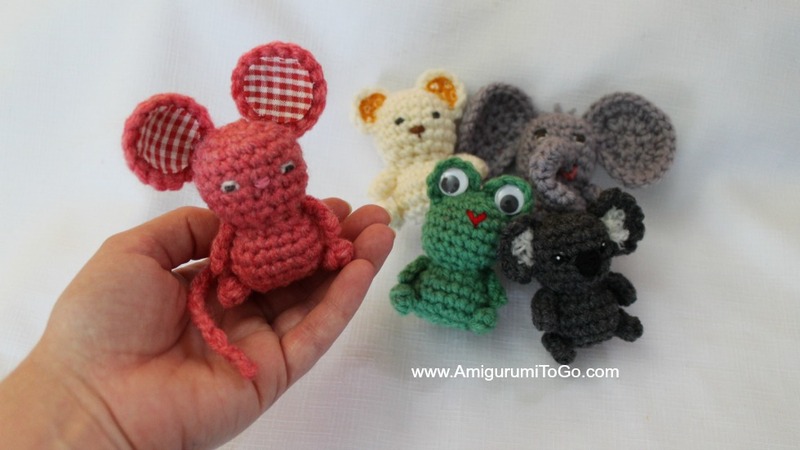 An elephant and mouse soon joined the tiny gang. I was in bed last night looking at these little guys and a story came to mind. My father phoned me one day and said he was heading out to work, (he's 83 and still runs his own sawmill), but couldn't quite make it as in between his workshop and his front door is an apple tree. He saw the mama first, she was looking up in the tree at her two cubs. Two baby bears were up there enjoying a feast of apples! Dad was stuck in his house for about an hour while the bears filled their bellies. How amazing is that? To live so close to nature that bears come for dinner! Dad really enjoyed watching them. I wish I could have seen them too! 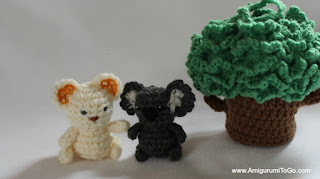 This story was dancing around in my head because of my tiny bears so I made the little tree. It actually fits 3 of these tiny animals, that part wasn't planned, it just happened that way. Then you can close up the tree and the animals are hidden inside. When my kids were younger they loved things that would hide other things inside, that was always great fun! Yes, there are patterns on the way for everything pictured here. The tree is hot off the hook so that pattern needs to be tested yet. 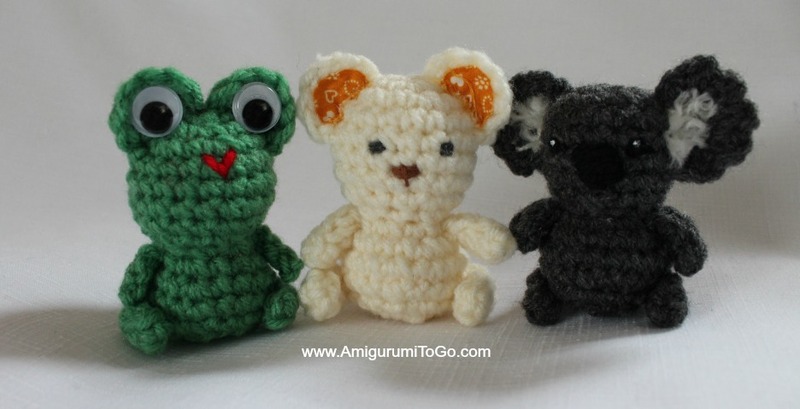 I will post the Bear pattern first and from that you will be able to make the koala and the frog. The elephant and mouse will be a separate pattern. The tree will be last. Such beautiful little creatures, and what a clever idea with the tree. Would make a lovely travel gift for a young child. Well done as always...waiting patiently for your patterns. Thank you for your wonderful creativity. 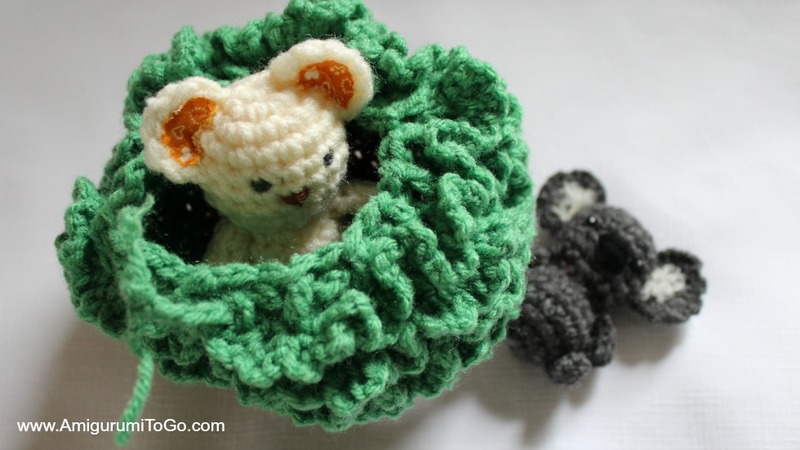 Great to see that computer problems can lead to cute crochet animals. They are great with their big ears. I love the story about your father. Special tht he is still working at his age. Oh, you are so clever! I can't wait for the new patterns. 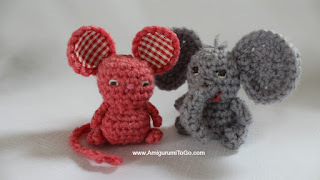 Wish the tiny elephant was soon as I'm in the process of making three for gifts and the tiny one would be the perfect one since you video your expert patterns. I have made used big foot elephant pattern for two, one I will keep and the other is a gift. I so enjoy your channel and blog. You've improved the quality of my life by sharing your talent so freely. Thank you. Have you posted the tiny mouse and squirrel yet? 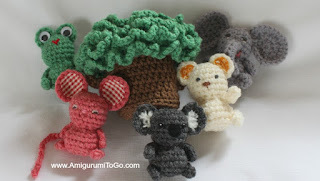 These are so cute I have made several and am looking forward to more. The tree is a little intimidating for me but I'm going to try it to. Thank you for sharing. Are the patterns for the tiny elephant and mouse out yet? I can't find them if they are. You are so talented. Thank you for sharing so freely. Making things from your patterns is such a blessing to me. Most of the Little Bigfoot friends I've made are going to under privileged children this Christmas. You are making a lot of children happy and adults to. God Bless you. Thank you for the kind words, I really appreciate that. Thank you for making gifts for those children, it is such an honor for me that you are using some of my patterns to bring joy to others! Many blessings to you! !